One of the most important parts of an air compressor is the pressure switch. It is not your typical switch that can cut off the power supply of a machine. Read on and learn more about air compressor pressure switch. 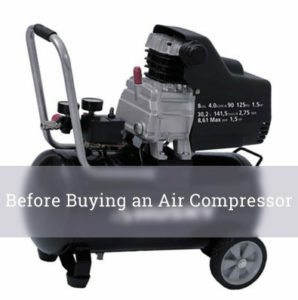 To avoid overheating and other forms of defects, it is necessary that air compressors have a pressure switch. Air pressure switch basically turn the current on or off from the pneumatic tool. 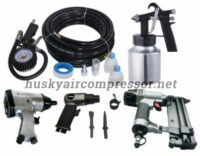 It controls the pressure that is created or released by the air compressor. 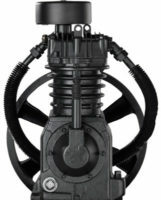 The switch is specifically designed for compressors that are powered by electricity, like most air compressors. After a certain level of pressure has been achieved and is contained in the receiving tank or reservoir, the current is turned off. On the other hand, if the pressure in the tank gets too low due to reasons such as leaks or usage, the gauge will signal the pressure switch to turn on to increase the pressure again. If there is no pressure switch or if it gets broken, the motors of the air compressor will run non-stop if the tank is empty or will not start running at all if the tank is full. This is how important the pressure switch is. Although they all have the same basic functions, air pressure switch comes in a variety of models. Some pressure switches have either on/off or auto/off feature which mean the same thing. ‘On’ or ‘auto’ will start the compressor based on a specific pressure set-point while ‘off’ will shut down the compressor. Pressure set-points are also known as the cut-in and the cut-out points. The cut-in point (close) is usually set at around 5.5 bar while the cut-out (open) point is usually set at around 7 bar. Some pressure switches don’t have this on/off feature. Rather, the motors start and stop based on the pressure reading. This is more common in large air compressors wherein the motors are dependent on external contact and motor starters. Pressure switches can also be classified based on the number of electrical contacts in the switch which open and close based on the pressure. There are 3-phase and 1-phase models. Those that have 3 separate contacts are classified under 3-phase models while those with only 1 set of contacts can be classified under the 1-phase model. Air pressure switches can also be grouped as to those have a built-in blow-down valve or those without. This valve is used to blow off any pressure that may be retained between the reservoir and the compressor when the air compressor stops. For this reason, the blow-down valve is called the unloader valve because it is designed to unload the air compressor with pressure. For those models without this built-in valve, there is a usually a space on the pressure switch where you can mount a separate valve. 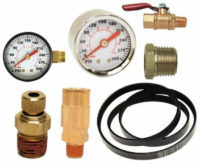 Since the pressure can be controlled, an air pressure gauge is also built in air compressors. As the name implies, it is used to measure air pressure. It works hand in hand with the pressure switch to control the pressure in the system. It gives accurate reading on the amount of pressure that is already in the reservoir. It is usually digital and battery-operated. Without this, it would be difficult to operate the air pressure switch because you can’t estimate the level of pressure. Since the pressure gauge is exposed to constant pressure, it is prone to quick wear-and-tear. Because of this, it can easily give out and would require replacement. If you think that the gauge is not giving out accurate measurements, you better check it immediately. For some air compressors that don’t have a built-in pressure gauge, you can purchase a portable one and mount them on the machine that you are measuring. Once your air pressure switch gets broken, the easiest way to repair it is to actually replace the unit. Most people find it better to just replace the unit than invest on a repair which is not guaranteed to be 100% fool-proof. A replacement would require a careful decision-making because there are several things that need to be considered in choosing the right replacement. One of the things that need to be considered is the cut-in pressure range. Your new switch should run at the lowest cut-in pressure value of the old one to prevent damage. The maximum pressure should also be used as basis. It is important that you do not set a pressure setting that the air compressor cannot handle. The on/off feature that is previously mentioned also needs to be taken into consideration. If your old one has this model, your new one should also have this. Replacing the air compressor pressure switch can be easily learned. However, for new users, it is advisable to still a professional who can assist you. It is better to be safe than sorry. Now that you already know the basics of pressure switch, it is now time to find the right one for you and your air compressor. 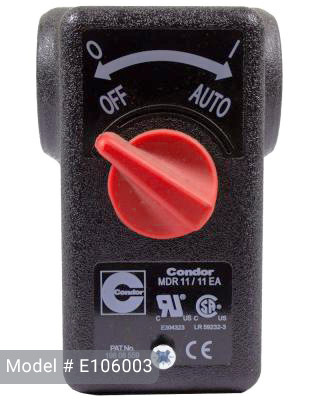 Certain models of pressure switches are compatible with your Husky air compressors such as Condor E106003. 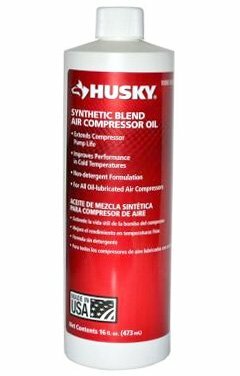 This fits with Husky stationary compressors such as the following: C601H, C602H and C801H. It has a pressure range of 125 psi to 155 psi. It comes at a cheap price of $44.75 in Home Depot. If you’re want to replace pressure switch for Husky C803H or Husky C802H Models then you should buy Condor E106203 pressure switch (Pressure range: 145-175 psi). As it best fits for such models. If you are looking for pressure switch for Husky C331H Model then you should search for the E106635 pressure switch (Pressure range: 135-165 PSI). Every single part of an air compressor needs to be running smoothly so that the entire machine will produce the desired output. Small things such as the pressure switch can make a huge difference on how the air compressor works. If you are not busy, take the time to check all the parts such as the pressure switch and see if they are still working properly. I have a Husky C801H. Which switch do I need? I have condor MDR11/11 EA mod, MDR11 preassure control switch. “E107200 that has stoped working, it seams that it will not turn the plastic rod on the switch side of the control. there is 241 volts at the line side of the switch. the max on this 60 gal unit looks to be 155 LBS, what switch can I use to replace the bad unit? I have a husky model number 41214 1.5 gal us 218549 air scout I need a pressor switch —how can I get one?